Facebook Groups are a great way for online marketing, Creating a group on Facebook is absolutely free and easy to create. It hardly takes 5 minutes to create a Group. There are many settings which you can implement to your Group. Many of the Facebook users create multiple groups. Facebook has some limits and strict rules to avoid spam. Learn Make Facebook Group Private or Secret. There are many benefits of having a group on Facebook. You can get targetted traffic with groups. 1) How to create a Facebook Group Page? 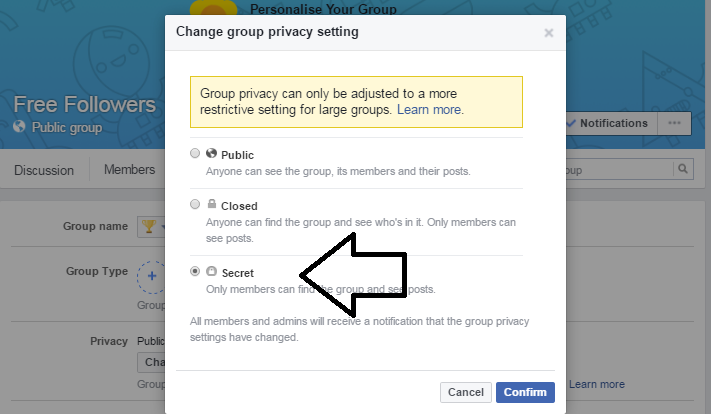 2) How to Make Facebook Group Private? 3) Benefits of Private Facebook Group. 1 How to Create a Facebook Group? Step #1) Log In to Facebook, at right side beside notifications small arrow key , under that there is an option of create a group. Step #2) Add a name that suits to your Interest. Step #3) Add a cover photo, add description and tags. Step #4) Add your all friends. Before I Explained How to Add your All Facebook Friends to Facebook Group in One Click. It can save your time. Even you can add a chrome extension called Facebook Group Invite All. 1) Open your Facebook Group Page. 4) There is an option of public, closed and secret, now hit to secret. 5) That’s it you are done now. 1) Free and easy to Create. 3) You can Promote CPA offers or your Blog Post and can make good Money Online. 4) You can easily add your All Facebook Friends to your Group on Facebook in one click. 5) It’s not only your friend who can request you for joining group anyone can request for joining the group. Admin can either accept or reject the proposal. 1) Easy to share the Information with Limited People. 2) Group Chat easily on the group with Members. 3) Nobody can search the group other than the members. Now it’s your Turn to Make a Facebook Group Private/Secret. Hope you all got to know my point about How to Make Facebook Group Private/secret? and the Benefits of a Private group on Facebook.